Here is another friday challenge for you to try. Check out Taylored Expressions for todays sketch. This is a really easy card to create. I actually had it completed in under 30 minutes which is not like me. I was proud of myself. Minimum, it usually takes me 3 hours to brainstorm and create a card. What a pretty color combination. And the silhouettes….simple, easy, and beautiful. This stamp set is called Upsy Daisy and there is a stampin’ up! promo right now…and this set is 15% off till Sept. 30th. Ana Wohlfahrt, Jami Sibley, Lynn Mercurio, Monika Davis, Sherrie Siemens, Stephanie Hargis, and Vicki Chrisman. Todays featured cupcake sampler is Nancy Morgan. CARDSTOCK: Whisper White, Kiwi Kiss, Basic Gray, and Baha Breeze. PATTERNED PAPER: Urban Garden Designer Series Paper. ACCESSORIES: Basic Gray Taffeta Ribbon, 3/16″ Corner Rounder Punch, White Stampin’ Emboss Powder, Horizontal Slot Punch. Yeah for Fridays! That means it is time for another one of Beate’s wsc. My sample for today is a set I instantly fell in love with….Under the Stars. 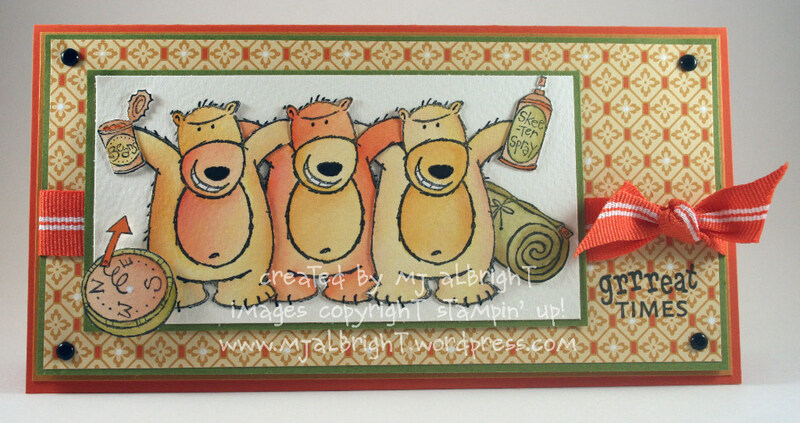 These bears look like they are about to party hearty lol. Cambria Turnbow, Charmaine Ikach, Jenn Balcer, Laurie Schmidlin, Lori Craig, and Sharon Harnist. Will be back shortly with another friday sample. CARDSTOCK: Tangerine Tango, More Mustard, Old Olive, and Watercolor Paper. PATTERNED PAPER: Haiku Designer Series Paper. INKS: Tangerine Tango, More Mustard, Old Olive, So Saffron, Creamy Caramel, Basic Black, Stazon Jet Black. ACCESSORIES: Tangerine Tango 5/8″ Striped Grosgrain Ribbon, Aqua Painter, Vintage Brads Assortment, Stampin’ Dimensionals, White uni-ball Signo Gel Pen. Today, I have a tutorial posted on scs that you can view –> here <–. If you have any questions, email me and I’ll try to assist you the best I can. 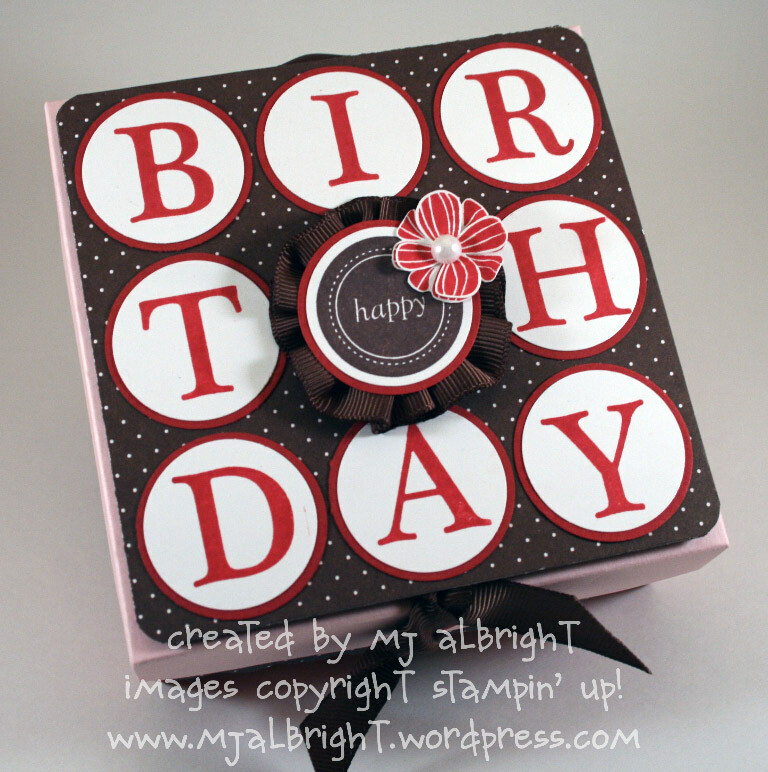 I first fell in love with this pop-up card way back in April of 2007 at the Stampin’ Up! Virginia Beach Regionals. I came home the next day and had to give it a try. I also made this Ahoy, Matey one for my convention swaps last year (yep, crazy for making about 60 of them lol). How cute! Such a nice surprise on the tag once pulled out. With this image from Eastern Blooms stamp set, you can add as much detail as your heart desires….or leave it stamped as is. Either was is simply beautiful. What I did: stamped the image in Kiwi Kiss on Whisper White CS; stamped image again in Rose Red and So Saffron ink on Whisper White CS; Yes…cut out the tiny flowers; adhere over your Kiwi Kiss stamped base image; apply any details to the centers of the flowers. For the So Saffron Flowers, I added orange beads from Orange Bead Duo. For the Rose Red Flowers, I punched rose red cardstock circles with my 1/8″ & 1/16″ Circle Punches, adhered, and added Crystal Effects over them. I also had to add a flower in the sentiment for coordination. Why I love this card is because it folds flat so it can be mailed. And it is such a nice surprise to pull the ribbon and reveal a stamped tag….and it is free standing so it sits up for displaying. How nice would these be if they were personalized and placed at a table as place settings to tell your company where to sit (ie: wedding or a holiday gathering/dinner). And they get to take the card with them. I would love to see what you create with this tutorial. There is a gallery on scs that I will be browsing. Also, don’t forget about my World Card Making Day Stamp Camp. Information –> here <–. ACCESSORIES: Pumpkin Pie 1/2″ Striped Grosgrain Ribbon; Hemp Twine; Pewter Jumbo Eyelet; Vintage Brads Assortment; Boho Blossoms Punch; 1/16″, 1/8″, 1/4″, 1-1/4″, and 1-3/8″ Circle Punches; 3/16″ Corner Rounder Punch; Crop-A-Dile Tool; Crystal Effects, Orange Beads Duo; Stampin’ Dimensionals; Sticky Strip; Mini Glue Dots. I created my own kinda sorta background paper using Whisper White cardstock scored to create squares with a stamped image within each square. I think if I had to make this card over I’d change the piece of Old Olive cardstock to a different color — I think with the brads at the corners it resembles a baseball field lol. There is nothing in the envelope….I placed it on the front as a focal point as if I was sending “birthday wishes” to someone. Ana Wohlfahrt, Stephanie Hargis, Jami Sibley, Vicki Chrisman, Monika Davis, Lynn Mercurio, and Sherrie Siemens. And this weeks featured cupcake sampler is Lynn Put. Thanks for stopping by and have a wonderful weekend!!! CARDSTOCK: Chocolate Chip, Old Olive, Baha Breeze, Tangerine Tango, and Whisper White. INKS USED: Chocolate Chip, Old Olive, Baha Breeze, and Tangerine Tango. ACCESSORIES USED: SU! Big Shot die-cutting machine, Scallop Envelope Bigz Die, Silver Brads, 1/4″ & 1″ Circle Punches, Boho Blossoms Punch, Silver Elastic Cord, Ice Circle Rhinestone Brad (green for center of circle on envelope closure), Stampin’ Sponges, and Stampin’ Dimensionals. I just love pink coneflowers. They are scattered throughout my flowerbeds. When I received this set, I instantly wanted to re-create the flowers around my home. How I did my petals: applied Pink Pirouette ink to stamp; applied Riding Hood Red to the tip of my finger; starting at petals edge (furthest away from stem), I pulled my inked finger through the ink on the stamp; stamp on cardstock to get a watercolored realistic image with a unique pattern to the petals. You can use whatever technique you’d like to achieve this look. I’m one to use whatever I have to achieve a certain look…and that means walking around with red finger tips for 2 days lol. See closeup below. CARDSTOCK: Riding Hood Red, Pink Pirouette, Whisper White, and Kiwi Kiss. PATTERNED PAPER: Bella Rose Designer Series Paper. INKS: Chocolate Chip, Kiwi Kiss, Riding Hood Red, and Pink Pirouette. ACCESSORIES: 5/8″ Chocolate Chip Grosgrain Ribbon, Crop-a-Dile, Coluzzle, Scallop Edge Punch, 3/16″ Corner Rounder Punch. I thought it would be fun to create a 3-D item this week. Ahhh, but guess what? It is more than that! The top of the gift box lid is a card:) It’s an “all-in-one” package! This would be a sideview front on. 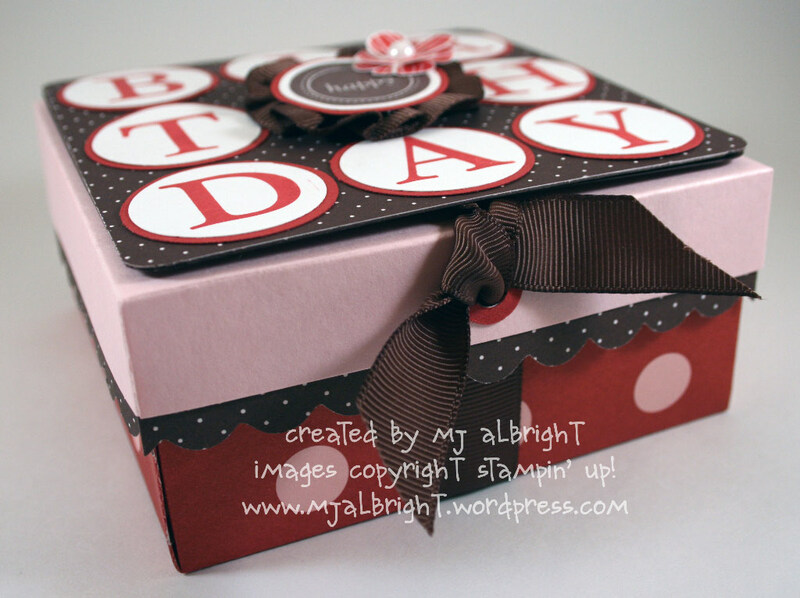 The box base was created with Bella Rose Designer Series Paper. 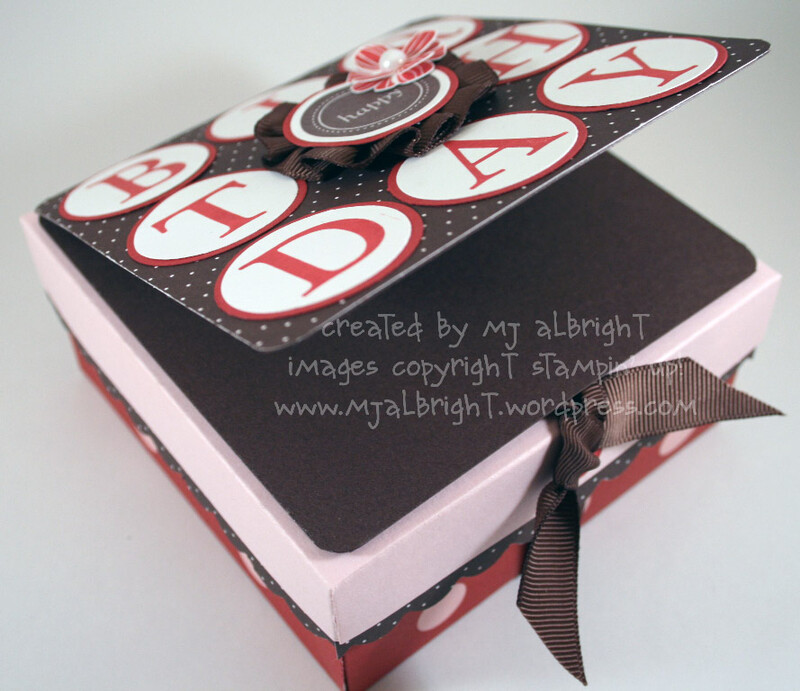 The lid is Pink Pirouette cardstock with a scalloped border created with a 3/16″ Corner Rounder PUnch. I did punch a hole in the lid x2 (front and back) with a 1/4″ Circle Punch. Made a Riding Hood Red cardstock circle for around the punched hole with my 1/4″ & 1/2″ Circle Punches so I could thread the 5/8″ Chocolate Chip Grosgrain Ribbon through it to keep the box closed nicely. This is a birds eye view of the project to show you the card feature of the lid. It is a 4-3/8″ square card that is attached to a 4-1/2″ lid with Glue Dots. I just love this idea…..at parties, the card always seems to get separated from the gift, so I thought this was neat. Picture giving this to a young girl. She can keep it after her party as a keepsake box. 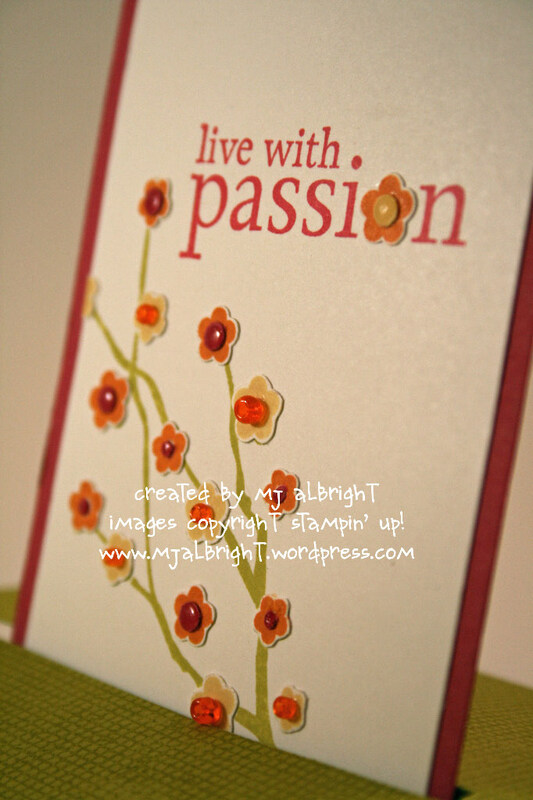 I just love this stamped flower from Eastern Blooms stamp set. I simply stamped it twice and cut the larger petals from one of the two images and attached together with a mini glue dot. Topped off with a Pearl from the Pretties Kit. 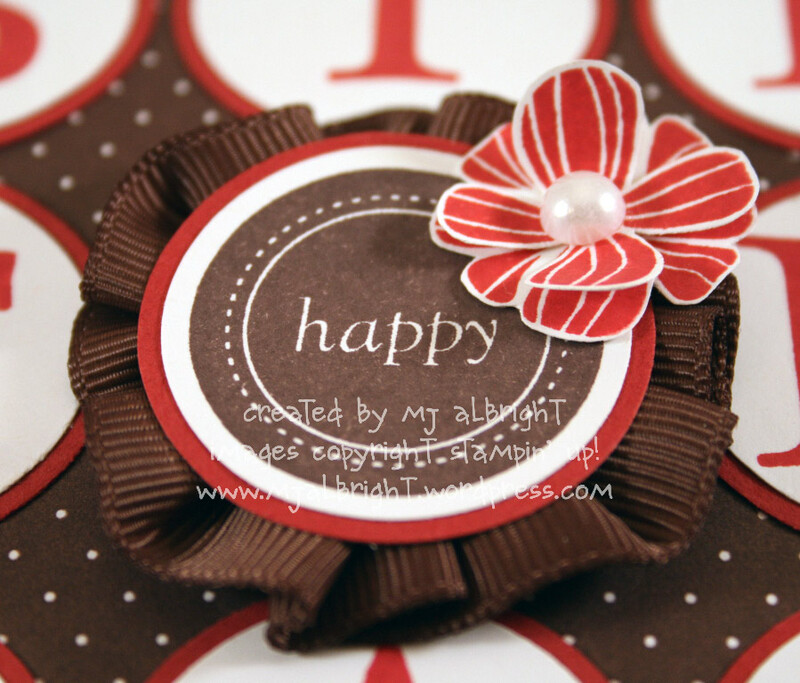 Created the rosette behind the sentiment with 5/8″ Chocolate Chip Grosgrain Ribbon. Check out what the rest of the cupcake crew came up with for Taylors challenge: Ana Wohlfahrt, Jami Sibley, Lynn Mercurio, Monika Davis, Sherrie Siemens, Stephanie Hargis, and Vicki Chrisman. And this weeks featured cupcake samper is Noelle McHone. Have a wonderful weekend and thanks for stopping by. CARDSTOCK: Chocolate Chip, Riding Hood Red, Pink Pirouette, and Whisper White. INKS: Riding Hood Red and Chocolate Chip Classic Stampin’ Pads. 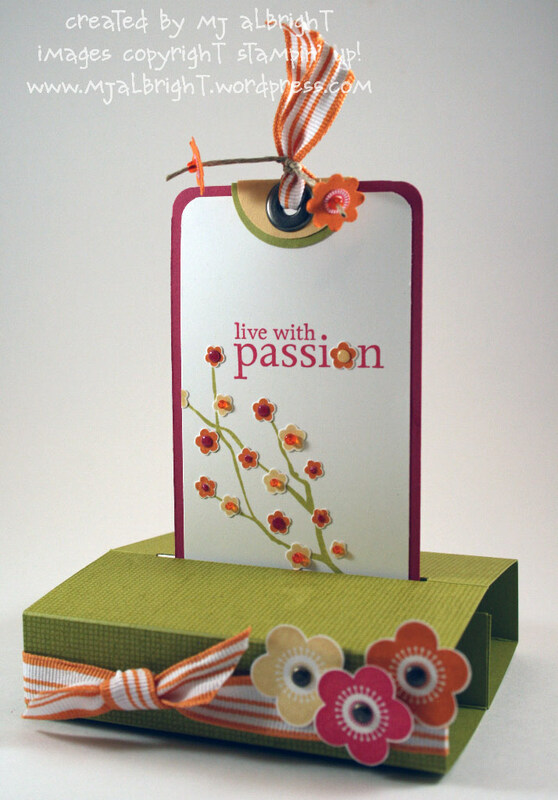 ACCESSORIES: Pretties Kit; 5/8″ Chocolate Chip Grosgrain Ribbon; Sticky Strip; Pop-Up Glue Dots. TOOLS: 3/16″ Corner Rounder Punch; Crafters’ Tool Kit; 1/4″, 1/2″, 1-1/4″, and 1-3/8″ Circle Punches. Out with the old (much loved) and in with the new! I have to get rid of *some* of my stash. By all means, don’t think that my Stampin’ Up! days are over. For me, they are just beginning. You will be noticing some changes here on my site…the first thing you’ll probably notice is that I’ve stepped down from all Design Teams. This was hard for me as I do consider everyone my dear friends and have met each one IRL. I’m basically taking a year off and doing some creating for challenges with Stampin’ Up! How fun and such a dream come true. This opportunity was offered to all of the Artisan Winners this year. That is all I can share with you at this time, and I can’t answer questions regarding this. STAMP SALE INFO: Paypal for payment; $4.80 flatrate shipping (will notify you with a shipping amount if you are ordering more than 1 set); email me @ mjplay613@comcast.net with set(s) you are interested in. Once there is a line through the set, it is sold. USA only. Have a wonderful day, and thanks for stopping by.